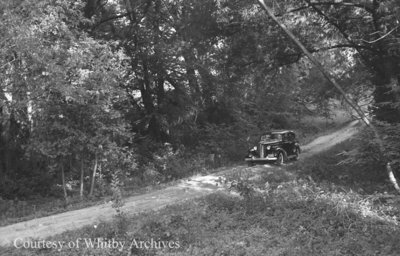 A black and white negative of a dirt road in a valley known as the Devil's Den in Whitby, Ontario. In this view a car is visible on the road. Devil's Den is a valley in the Heber Down Conservation Area in Whitby, Ontario. Devil's Den, August 1, 1938, Marjorie Ruddy. Whitby Archives A2013_040_759D.